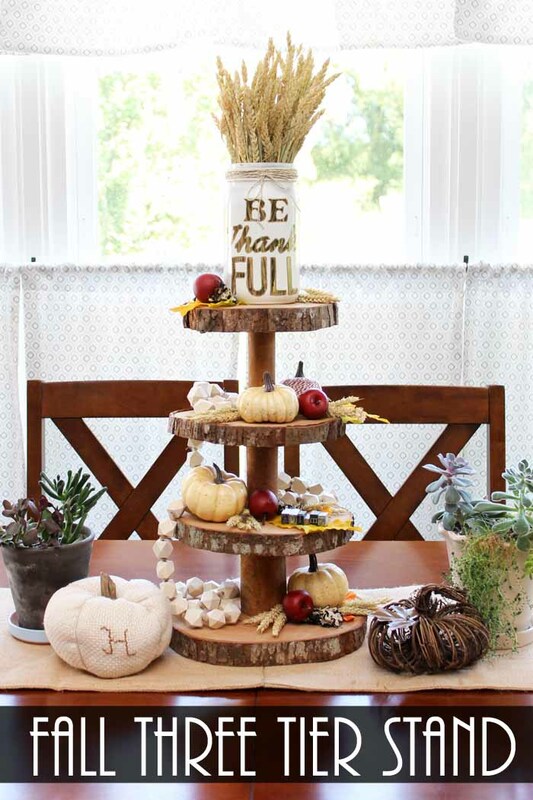 Decorate a three tier stand for fall! I am adding a few touches of autumn to a few rooms and couldn’t wait to add a centerpiece to my table. I ordered this three tier stand and it was the perfect rustic farmhouse style accent. 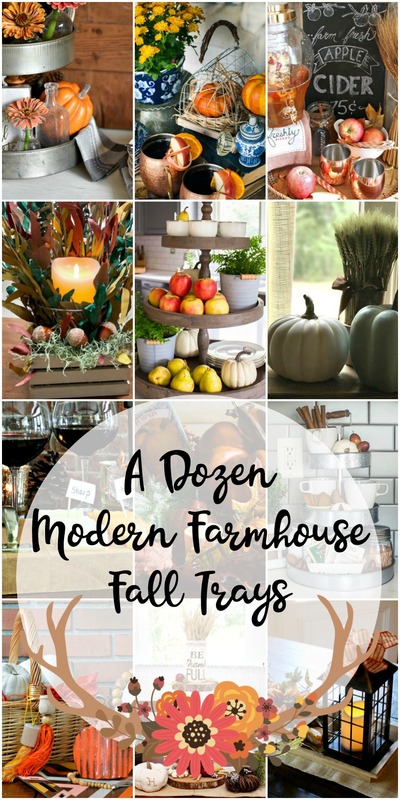 A few other bloggers are joining me in a farmhouse style tray hop as well. You can see the links to their post at the bottom of this post. Y’all enjoy! I started with my Thanksgiving mason jar on the top tier. It is the perfect addition! I filled it with some wheat then also added an artificial leave and apple to the top. The entire stand is filled with various artificial pumpkins. I even included one of my baker’s twine pumpkins on the second tier. I have a thing for old vintage type press letters and spelled AUTUMN with them on the third tier. That wood bead garland is from a local store at Christmas last year. I have been unable to find those faceted beads online anywhere. It is literally one of my favorite things to use in my decor year round. I let the wood beads spill from tier to tier all the way from the top to the bottom of the stand. There is some moss on several of the tiers as well. This version came from a variety pack and is simple and also rustic. Perfect for some farmhouse decor. I then added some of my potted succulents on either side of the tray. This window is just perfect for growing them. You will also find my monk’s cloth pumpkin on one side. I am also sort of loving these grapevine pumpkins that I found. 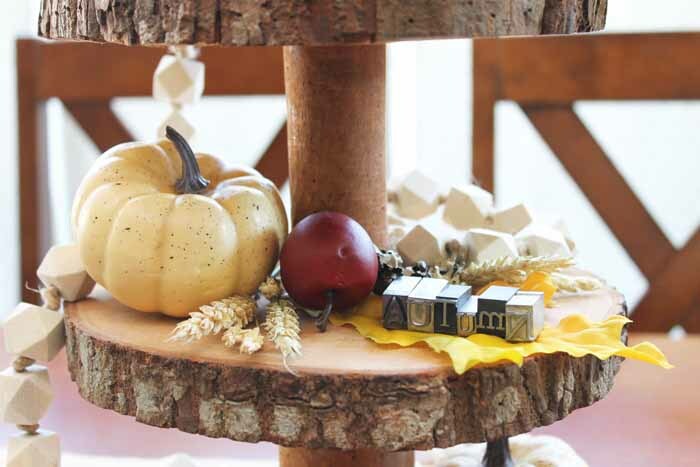 An adorable little rustic touch! 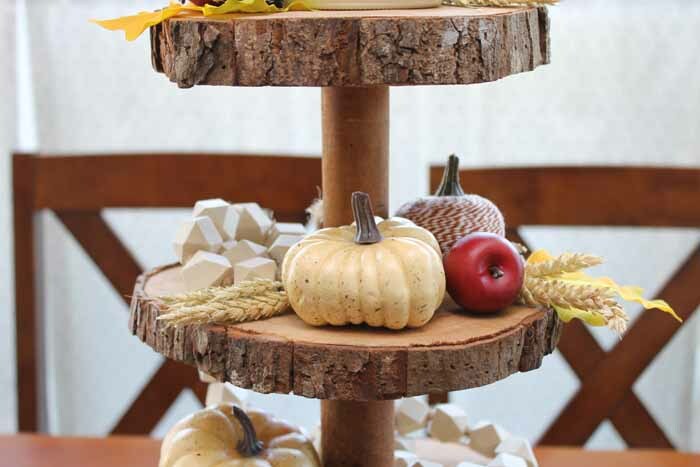 This three tier stand is perfect for fall and for the center of our table. 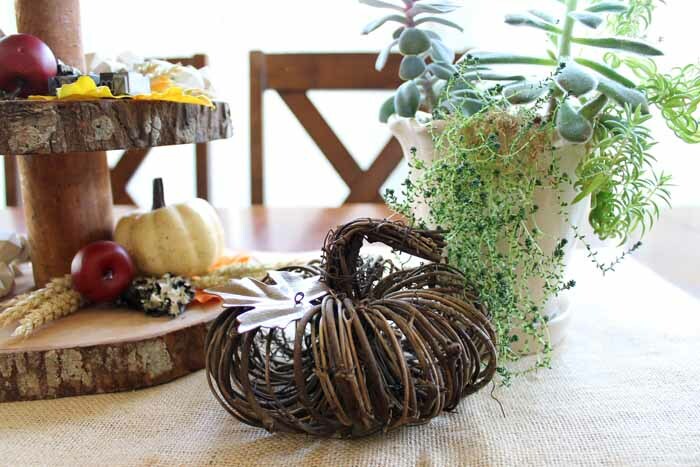 Want to add a little autumn flair to your home? Try some of these ideas for yourself. You might just love the results. 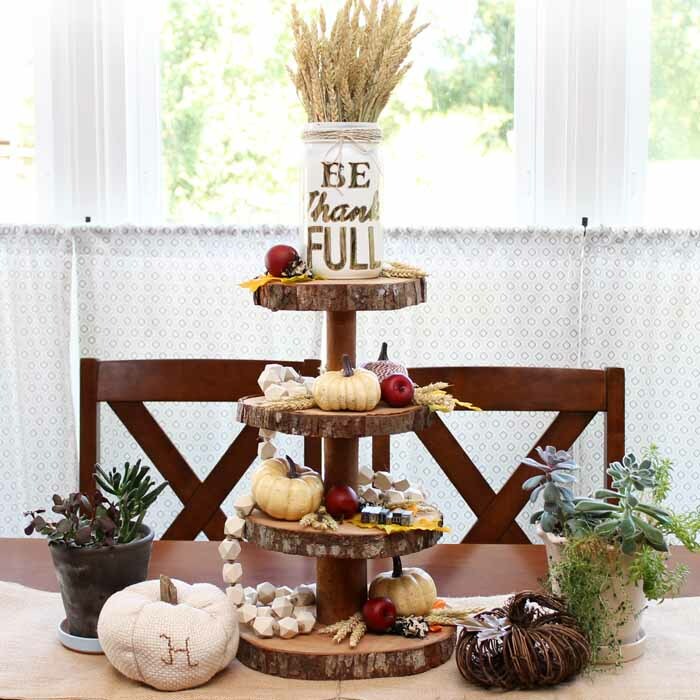 Love this three tier stand and want more farmhouse ideas for fall? I have tons of ideas from other bloggers in this series below. Y’all enjoy! 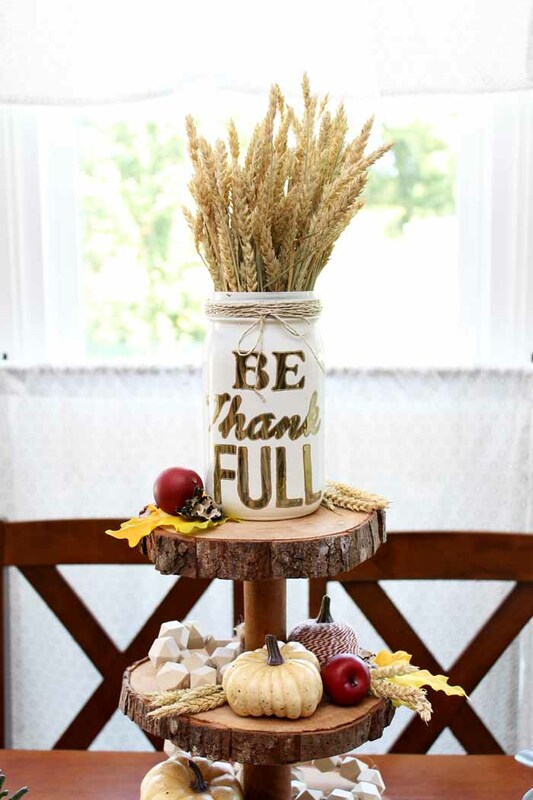 previous post: Decorative Jars for Fall: 45 Ideas for You! Thanks for walking us through how you put everything together. It’s lovely! There is so much to love here! 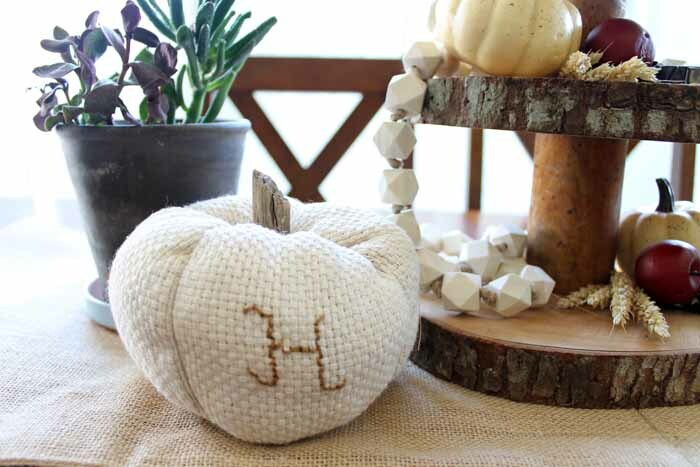 Of course the mason jar is fabulous, but I also love your little cloth pumpkin with the “H”… so darling! What a charming farmhouse tray. What a cool tiered tray, Angie!! You did a great job styling it. I’m imagining it with cheeses and crackers and fruit for a fall party. LOVE it!! This is so cool. I need one, Angie! Love that wood slice tray!!!! 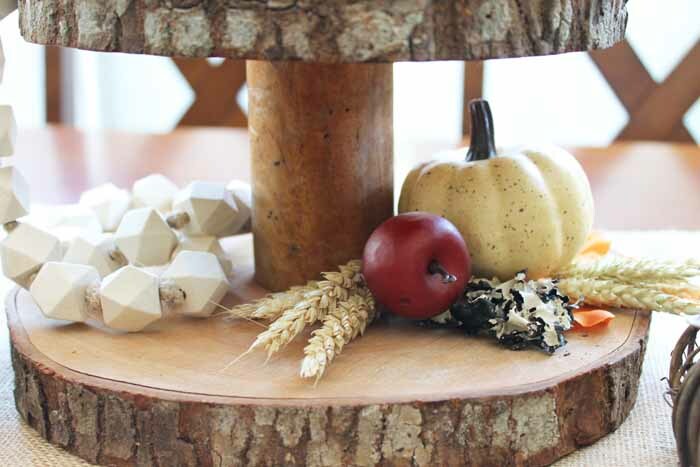 Makes for a gorgeous fall centerpiece! 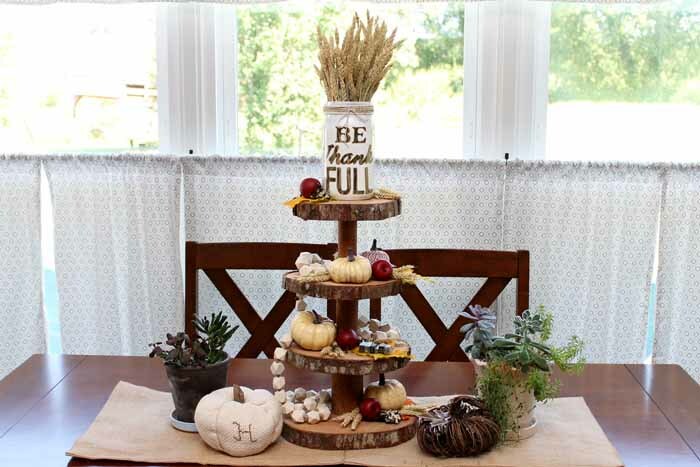 Your tiered tray is beautiful, Angie, and I absolutely love the way you styled it! I would love to use it for entertaining and cover it in cupcakes! Have an awesome fall. I love your styling and bet you had fun playing with it. I can also see the tray being used in so many ways. Hi! I came over from Simple Nature Decor! What a wonderful idea. I wish I would have seen this when we lived in the country with 3 acres of woods. I love Autumn and your decor certainly celebrates it. This tiered stand is an eye catcher on its own! And so many ways to dress it up. Beautiful! I love tiered stands! I pinned this so I will have lots of inspiration for several Fall seasons! Looks great! I love that tier stand. Stopped by from the sweet inspiration party! The display is so charming! The 3-tiered stand really makes for a great centrepiece. My favourite part, though, is that super cute ‘Be Thankful’ jar – like the icing on a cake. Love it! Love this stand – it’s perfect for farmhouse decor and I can imagine it in every season all decked out. Great tutorial – thanks for sharing. Pinning this. Angie, Love the wood slice tier stand! Looks so great dress up for fall!